Kaltenkirchen, 25 March 2019 – "100 years - One team" is the centenary motto for the industry, trade and shipbuilding supplier WISKA. The family company from Kaltenkirchen near Hamburg, Germany, celebrates its centenary this year. A highlight of the year long festivities will be the trade fair in Hanover. "In sports, a good team is what really counts. Moreover, with good people, work is even more fun. This is what we take as an example in our centenary year and invite our business partners to celebrate together with us "100 years - one team" on our exhibition stand in Hanover”, says Ronald Hoppmann, 3rd generation General Manager of WISKA, together with his sister Tanja. Visitors are welcome to explore their current product range, for example, the SPRINT® cable gland system (Pic. 1), that due to its modular design fits to almost any cable type and application. From standard to bend protection over external strain relief and explosion-proof to applications in extreme weather conditions, SPRINT® offers any solution. In addition to cable entries, cable glands and junction boxes, WISKA will also be presenting the Brace® system (Pic. 2) for cable protection. The BraceFITTING, the centerpiece of the system, has a 360 degree closing mechanism for simple installation. The system further comprises of both metal and non-metal fittings, conduits and sleeve types. And because it is not every year you turn 100, the Hannover Messe is the perfect place to celebrate this special occasion. On 2 April, from 6 p. m., the stand will become a party area and guests of the exhibition are kindly invited to become part of the team celebration. Ronald Hoppmann gives another good piece of advice for everyone who wants to come along. "Bring plenty of energy for dancing – our live band and DJ will give their all." Founded in Hamburg in 1919, we are today one of the leading manufacturers of electrical equipment, lighting products and CCTV video surveillance for trade, industry and shipbuilding. We operate our own research and development facilities and production plants next door at our headquarters in Germany. Our global sales network of representatives and subsidiaries ensure a quick and personal on-site customer service for you. The WISKA Group today employs 260 people worldwide. At WindEnergy, the international wind energy trade fair in Hamburg, the supplier for industry, trade and shipbuilding WISKA® presents its new products in the fields of CCTV video surveillance, lighting and cable entry. The video surveillance range has been extended: WISKA® showcases a new Plastic PTZ IP Dome Camera D100 (pic. 1) for offshore applications at WindEnergy. Also, the camera range has been extended with explosion-proof and nightvision products. This also helps to increase safety and security. When it comes to lighting, the LED Floodlight 5000 is undoubtedly one of their major highlights (pic. 2). It is ideally suited for applications under extreme weather conditions, as it is heat- conductive and corrosion-free due to its special modular design of high-quality plastic modules and stainless steel housing. To meet different lighting requirements, the floodlights is now also available with “narrow” and “wide beam” lens types. At the WindEnergy WISKA® is solidifying its position as a full-range supplier in the field of cable entries and presents the cable protection system Brace® (pic. 3). The heart of the system is the BraceFITTING. The fastening section of the BraceFITTING is designed in such a way that it directly grips into the conduit and can be opened and closed again using a standard tool in just a few seconds. Part of the system are also non-metallic conduits and the metallic range of fittings and conduits. The range is rounded off by braided and woven sleeves for comprehensive protection. The innovative cable entry system CONMAXX (pic. 4) consists of three components: Frame, grid inserts and conical sealing elements. The three components can be compiled individually according to requirement and application. This way, the entry system can be assembled from the inside out. Together with the WISKA® typical junction boxes, they cover the majority of electrical installation on board and are also presented at SMM. Hamburg, 4 September – At SMM, the world´s leading trade fair for the maritime industry, in Hamburg, the supplier for trade, industries and shipbuilding presents product novelties in the fields of reefer container sockets, CCTV video surveillance, lighting and cable entries. 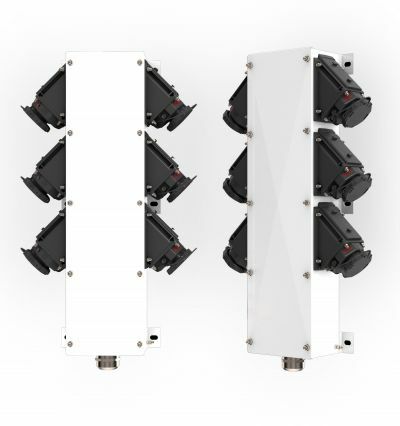 Driven by their ideas and exhibits of product intelligence for lighting and reefer sockets, WISKA® also wants to discuss possible applications of these in maritime surroundings. “As a company founded in Hamburg, we have been exhibiting at SMM for decades – and each time are more than happy to do so. We like to see partners, showcase new products and keep in touch about future and current maritime subjects. Exhibiting here at SMM in Hamburg, always feels like a `Heimspiel´ for us, which is the German word for “home game”.”, says WISKA® General Manager Ronald Hoppmann. And at this year´s SMM, the company presents several new product highlights. The VARITAIN® reefer container socket range is famous for meeting most individual demands on board. And now it has been extended by two new spacesavers. The new VARITAIN® PushIn Rack (pic. 1) has been designed in upright position to offer a maximum of reefer connections on the same space. The sockets are designed with a 45° angle to ensure a space-saving product and safe installation. The Advance version (pic. 2) of the PushIn Rack further has an external power connection and the smallest housing of the VARITAIN® series. „The external powerport significantly simplifies installation as the main power supply is very comfortable to connect. The risk of damages is minimised, because the housing´s lid can stay closed during the whole installation process.“, Ronald Hoppmann explains. 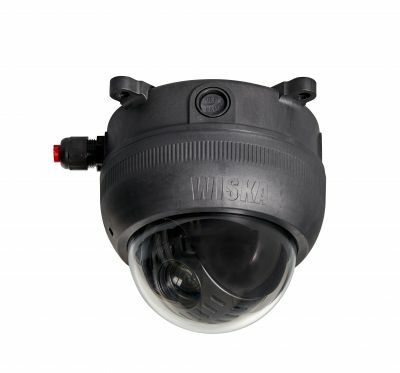 Also the video surveillance range has been extended: WISKA® showcases a new Plastic PTZ IP Dome Camera D100 (pic. 3) for maritime applications at SMM. Also, the camera range has been extended with explosion-proof and nightvision products. This also helps to increase safety and security on board. When it comes to lighting, the LED Floodlight 5000 is undoubtedly one of their major highlights (pic. 4). It is ideally suited for applications under extreme weather conditions at sea, as it is heat- conductive and corrosion-free due to its special modular design of high-quality plastic modules and stainless steel housing. To meet different lighting requirements, the floodlights is now also available with “narrow” and “wide beam” lens types. The cable entries range of WISKA® newly also comprises a comprehensive cable protection range with metallic and non-metallic fittings and conduits. Together with the WISKA® typical junction boxes, they cover the majority of electrical installation on board and are also presented at SMM. Football connects, as the supplier for the electrical trade, industry and shipbuilding, WISKA from Kaltenkirchen, found when it invited customers and partners to attend the first WISKA Business Cup. 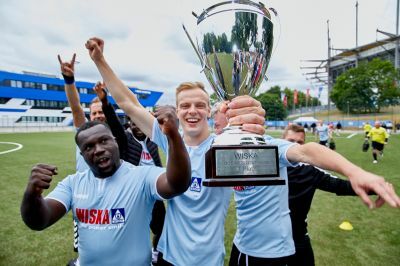 A total of eight companies from the electrical trades and wholesalers as well as international sales partners from England, Ireland and the Netherlands kicked a ball around in style in front of the Volksparkstadion in Hamburg to win their very own trophy. Teams applied in advance to take part via the WISKA lottery. ‘Achieving good figures with customers and partners is important, but it is even more important to know each other well. This not only makes our work more successful, but also simply makes it more fun to spend time together’, says WISKA Managing Director Ronald Hoppmann, who is the third generation of the family to manage the company together with his sister Tanja Hoppmann. The joy of playing and the fun that was had also inspired former HSV professional, current DFB sports director and coach of the women's national team Horst Hrubesch. The former international came as a surprise guest and was enthusiastic about the mood of everyone involved. It was also Hrubesch who presented the Cup to the winners of the tournament, the team from electrical wholesaler Hillmann & Ploog. Second and third places went to the two teams from WISKA Germany. The top scorer of the day was Callum Wilson from Team WISKA UK. Even after the award ceremony, the atmosphere remained relaxed. ‘We do it like the pros. On the pitch, we’re united by our enthusiasm for sporting competition and off the pitch, we're inspired by working together’, summarises Hoppmann, adding: ‘We're delighted that many young players have also taken part in the guest teams – because the promotion of young talent is particularly important to us as a family company. Not only at WISKA itself, but also in our home region at Hamburger SV, which enabled us to host this event at the stadium. And because football fever works up an appetite, the teams went on to a Hamburg beach club after the tournament, where the eventful day ended with a relaxed barbecue by the Elbe. The following day, all the guests got the opportunity to get to know WISKA on site in Kaltenkirchen – from development and production to the laboratory. The new edition of the popular “WISKA box” presented this March, one of the latest WISKA highlights, was essential viewing, not least as a result of the direct cooperation with craftspeople who were hugely enthusiastic and already flirting with the idea of registering early for the next WISKA Business Cup. Trade and industry supplier WISKA presents its new highlights in installa-tion material at this year´s Light + Building in Frankfurt. 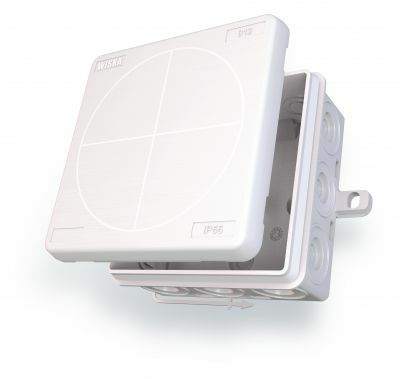 This year WISKA have focused on their newly developed junction box range. WISKA has added two new sizes to its popular COMBI series and the WISKA installation box has receieved a total make-over. „The new COMBI boxes come with the proven quality of the series, that is characterised by its UV- and ozone resistance“, explains Stefan Stange-Düsterhöft, electrical wholesale and trade sales manager at WISKA. Just push the cable through the soft membrane and it is automatically sealed with IP66 protection – that is how easy the installation with the new COMBI 116 is. Twice the size as the already established COMBI 108 it offers greater installation space and flexibility. The new COMBI 206 measures 85x49 centimeters and has a space-saving rectangular form. This makes it perfect for outside applications and LED luminaires. Six threaded membrane entries help create maxi-mum flexibility. When developing the new installation boxes WISKA has taken into consideration the everyday needs of electricians at work. The new WISKA installation boxes offer comprehensive fixing options: whether with cable ties, screws and dowels or with various fixing elements. Furthermore the lid can be fitted tightly without use of a tool or screws. “The new installation boxes is a continued development of the popular KA series which WISKA initially developed over 80 years ago. For the relaunch we have spoken with electricians about what is important for them. The results have been considered in the development.”, says Stefan Stange-Düsterhöft. Industry, trade and shipbuilding supplier WISKA is expanding its product range to solidify its position as a full-range supplier in the field of cable entries with a new development in cable protection: a fitting for non-metallic conduits called BraceFITTING. "By now, users had to make sure that the correct fittings were used in accordance with the applicable protection requirements. Our new system, however, has been designed for IP68 from the go. Thereby the product always offers the highest protection standard for every conceivable application, while this also helps with storage as only one single fully assembled component has to be kept in stock", explained Lars Wiemann-Laasner, Business Development Manager Industry at WISKA. In addition to providing comprehensive protection, the product allows significant time savings during assembly and maintenance. 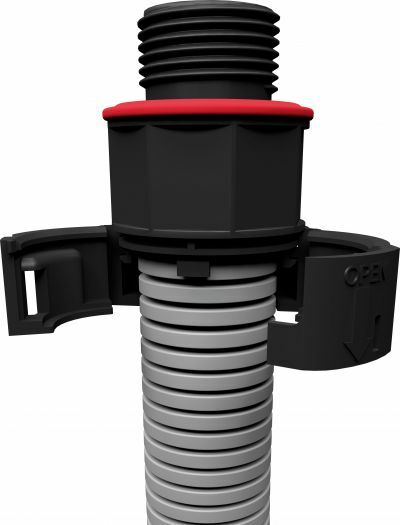 The fastening section of the BraceFITTING is designed in such a way that it directly grips into the conduit and can be opened and closed again using a standard tool in just a few seconds. 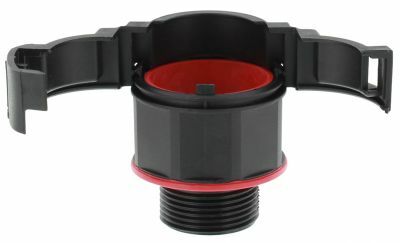 The sealing ring is connected directly to the product by two component injection moulding. This ensures perfect sealing properties and guarantees that the ring cannot be lost during assembly. The idea of supplementing the existing product portfolio of cable glands and a cable entry system with cable protection was clear and obvious to Lars Wiemann-Laasner. "We strive to provide our customers with comprehensive solutions in the field of cable protection. 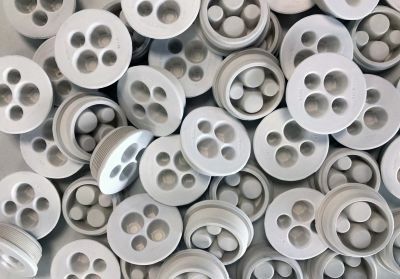 As a supplier with many years of experience in plastics processing, it was merely the next logical step to have this knowledge influence the development of the new product." 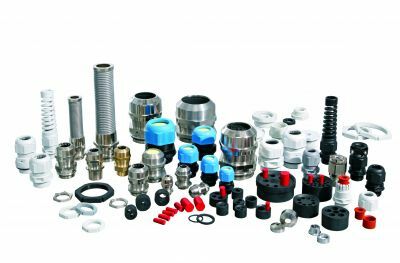 In addition to the BraceFITTING, the company based near Hamburg also supplies the corresponding non-metallic conduits and the metallic range of fittings and conduits. The range is rounded off by braided and woven sleeves for comprehensive protection. HERE you can find further information about our Brace® cable protection system and technical details. WISKA is showcasing its new cable protection range Brace® live at SPS IPC Drives exhibition in Nuremberg, 28 to 30 November, hall 5, stand 445. The Hamburger SV (HSV) can once again look forward to a sponsorship from WISKA during the season 2017/18. The company is a supplier to diverse industries, trade and shipbuilding and has extended its partnership as sponsor of the long-established German Bundesliga football team. Furthermore, WISKA is also one of the first companies to get involved in HSV’s newly formed association for young talents. ‘The fact that WISKA is continuing to sponsor the HSV demonstrates great trust in the partnership. As a sponsor of our junior teams, our partner is now also getting involved in the vocational and advanced training of our young football players. There isn’t enough praise that can be said for this commitment,” said HSV CEO Heribert Bruchhagen, commending the further collaboration. ‘With its newly built campus, the HSV has established an intensive training centre in which young talents have the opportunity to launch their careers in professional sports. As a family-run company, we know how important this support is. Young people need an opportunity to prove themselves. This is a very good way to build a bridge into the future. That’s why we expanded our partnership to include sponsoring young talents,’ said WISKA general manager Ronald Hoppmann, who leads the company in its third generation together with his sister Tanja Hoppmann. Supporting young people has always been extremely important to WISKA – which is demonstrated by the company’s vocational trainee to employee ratio of 10 %. In addition to providing young people with comprehensive vocational training, a focus is also on self-responsibility. From internal projects to representing the company at established trade fairs – at WISKA, vocational trainees learn what it means to play an active role in shaping the company and to assume responsibility. On the Hannover Messe two novelties are awaiting the visitors on the WISKA fair stand. Both benefit from the long standing expertise in twin-shot moulding. The cable gland MARATHON convinces with its new design and elevated strain relief according to category B (EN 62444). This has been realized by separating the sealing from the strain relief function. 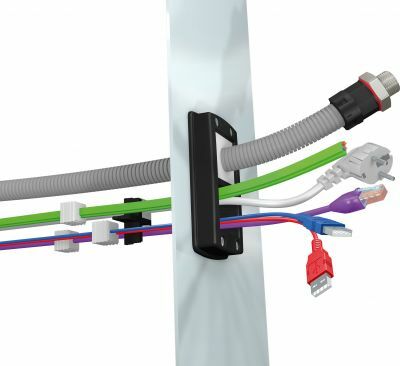 The new MultiCLIXX combines the advantages of existing grommets by WISKA: Customers can insert up to four cables via the soft membrane component at a minimum of time. Strain relief is accomplished by the intelligent grommet construction. With the introduction of the Brace cable protection system and the cable entry system CONMAXX in the last year WISKA now offers its customers all cable entry solutions from its own production, including the proven cable gland range. Besides the product news the focus on the fair is getting to know customers and partners better and deepening the business relation. “A good relationship is based on knowing each other. For good business relations this is extremely important as well as a trust basis”, says Ronald Hoppmann, General Manager of WISKA. This keynote is also reflected in the communication of WISKA and the fair stand which focuses on relationships. Coffee house elements such as furnishings, a coffee bar and a bench invite to linger and have good talks to get to know each other. „We are convinced that good business works like that. Fist get to know each other and then talk about our customer´s needs and ours products. “, adds Hoppmann. The fair stand of WISKA on the Hannover Messe can be found in Hall 13, Stand C76. WISKA, the expert for cable glands, has been expanding its product range of cable entry solutions in 2016. In addition to the tried and tested cable glands in polyamide, brass and stainless steel WISKA now offers two entirely new product lines: the cable protection system Brace and the modular cable entry system CONMAXX. Furthermore the supplier for industry and shipbuilding from Kaltenkirchen has introduced the ShotGLAND series, a gland for extreme temperature environment as well as new venting pressure equalization elements. At the SPS, Europe’s leading exhibition for electric automation, WISKA presents all these product highlights and its extended range in cable entry to the professional public. The Brace system is brand new. Heart of the new product line is the BraceGLAND, an innovative non-metallic fitting, developed and produced in-house at WISKA´s headquarters in Kaltenkirchen, North of Hamburg. Thanks to its 360° clasp mechanism, this product is safe to install and has a high integrated strain relief for reliable protection, e.g. against heavy vibration. Furthermore the large sealing area means that no special cutting tool for the conduit is needed. At the same time the high IP protection class reliably ensures that no dust and water can enter. Alongside the innovative non-metallic fitting, WISKA offers an extensive cable protection portfolio of premium non-metallic conduits, as well as sleeves. The development of the WISKA cable protection system was rated as especially innovative by the federal state of Schleswig Holstein and is therefore financially supported with means of the ERDF. With CONMAXX, WISKA presents a modular cable entry system especially well adapted for cabinet applications and electrical housings at InnoTrans. CONMAXX consists of three components: Frame, grid inserts and conical sealing elements. The three components can be compiled individually according to requirement and application. This way, the entry system can be assembled from the inside out. Therefore even subsequent, individual changes to the wiring are no problem due to the optional split sealing elements and the closed frame. With 100 different seals, four frame sizes and four grid inserts, CONMAXX enables an extremely flexible and individual electrical installation. The ShotGLAND cable gland series from WISKA is one of the flattest cable glands on the market. With silicone sealing, the LT version of the ShotGLAND can be used in temperatures ranging from -60 °C to 180 °C. SPS IPC Drives will take place from 22 to 24 November 2016. WISKA is located in Hall 5, Stand 445. WISKA, the expert for cable glands, is adding cable protection to its range. At the leading international trade fair for transport technology, InnoTrans, the company from Northern Germany presents the new Brace system to the professional public. Heart of the new product line is the BraceGLAND, an innovative non-metallic fitting, developed and produced in-house at WISKA´s headquarters in Kaltenkirchen, North of Hamburg. Thanks to its 360° clasp mechanism, this product is safe to install and has a high integrated strain relief for reliable protection, e.g. against heavy vibration. Furthermore the large sealing area means that no special cutting tool for the conduit is needed. At the same time the high IP protection class reliably ensures that no dust and water can enter. Alongside the innovative non-metallic fitting, WISKA offers an extensive cable protection portfolio of premium non-metallic conduits, as well as sleeves. The development of the WISKA cable protection system was rated as especially innovative by the federal state of Schleswig Holstein and is therefore financially supported with means of the ERDF. Furthermore WISKA presents cable glands of its Railway series made of brass, polyamide and stainless steel which comply with the unified European fire safety standard EN 45545 and meet the highest requirements of Hazard Level 3. An ideal addition to the railway series is the ShotGLAND cable gland series from WISKA, one of the flattest cable glands on the market. With silicone sealing, the LT version of the ShotGLAND can be used in temperatures ranging from -60 °C to 180 °C. InnoTrans will take place from 20 to 23 September 2016. WISKA is located in Hall 12, Stand 311.